Question: Tell me the truth. 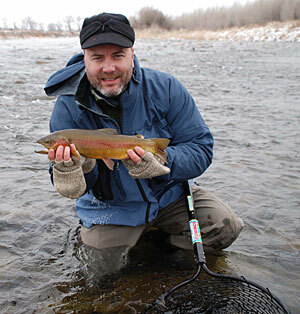 Is it really worth fly fishing in the winter? I’ve read all the magazine articles and looked at the pictures, but I still don’t quite believe that an average Joe like me is gonna catch fish in January on rivers that no one’s ever heard of. Should I put my gear away, or what? Phil Monahan with a winter cuttbow. Answer: It’s funny that someone from your part of the world should ask that question. The very first winter trout I ever caught came from the Musconetcong River in Hackettstown, New Jersey, almost 20 years ago. Like you, I didn’t really believe it would happen and was completely shocked when my indicator went under. But when I raised my rod, I came tight to a foot-long brown. Since then, I’ve enjoyed lots of cold-weather fishing, in places as disparate as New Hampshire, North Carolina, and Montana. On one memorable day, I arrived at Armstrong’s Spring Creek in Paradise Valley with the mercury stuck at 17 degrees Fahrenheit, only to find trout rising to a hatch of blue-winged olives. That said, winter fishing is often about reduced expectations. Despite the above example, you’re usually not going to run into pods of fish feeding on the surface the way you might in June, and no trout are going to charge down your streamer in the way a spawn-enraged brown will in October. I always head out into the cold with the goal of catching a single trout; anything else is gravy. That way, if I catch three, I feel like I’ve hit the jackpot. There are two keys to winter fishing: picking the right days and slowing everything down. In general, unless you’re fishing a tailwater or a spring creek, you don’t want to be on the water when it’s bitter cold out. It’s no fun for you, and the fish can be extremely sluggish. I’ve heard of guys nymphing on Colorado’s Taylor River when it’s 30 below out, but that strikes me as right on the edge of insanity. Ideally, you want a day that’s part of a warming trend, so if you see the temps heading upward—say from the twenties to the low or mid thirties—plan a day to fish. Winter fishing is almost exclusively a nymphing game, with a light leader under an indicator. I have never worried about matching specific patterns, choosing instead to go with generalist nymphs, such as a Hare’s Ear, Copper John, Scud, or Pheasant Tail. And because fish aren’t willing to move very far to eat your offering, fish a two-fly tandem rig. Two patterns in the water means a better chance of bumping a fish in the nose with one of them. Winter trout usually hold in slower water—deep pools, long runs, and at the base of waterfalls—so you’ll want to focus on these areas. Work slowly, making a lot of drifts through each piece of water. It’s amazing that you can drift through a spot 20 times without the slightest bump, only to have the indicator dive on the 21st pass. But don’t leave home without a few winter dry flies. About two or three years after I caught that first trout on the Musconetcong, I was fishing Big Flat Brook in the northwestern corner of the Garden State, when I was shocked again by the sight of several trout rising at the tailout of a pool. These were the first winter risers I’d come across. Luckily, I had a few Griffith’s Gnats in my vest, and I managed to take one of the trout by swinging the fly just under the surface. This was another proud moment in my maturation as an angler. This wouldn’t be a proper article on winter fishing if it didn’t discuss preparing for the cold. But I’m guessing that you’re smart enough to put on a coat, hat, and gloves when it’s 30 degrees out. Am I right? Layer up, and most importantly, keep your body dry. One little leak can be more than an inconvenience when it’s really cold out.